So, for those of you awesome GTBTC fans who actually follow me on Instagram, you probably already know about my fear of using my Crockpot. I totally understand that it’s not very powerful, and that no one’s house burns down because of it, and that like… everyone else uses it and leaves their house and their house doesn’t burn to the ground… but it’s scary! What if that happens to me?! One of the things I want to do this winter season is to start using the crock more… without anxiety. I can do that, I think! With the new job, I have to work one day a week as a “late” day, where I come into work at 11:45am and work until 8:15pm. It’s not the most ideal schedule but it’s great for using the crock. I’ve done it a few times now, and it’s awesome. In the morning, I do all the prep, stick my food in the crock, and then have it ready for Dave and I to eat once I get home late. It’s so much better than starting to cook at 9pm. This recipe is fabulous, and I can’t wait to make it again. I even have enough leftover of all of the ingredients to make it a second time without shopping again! Perfect! This vegetarian-friendly soup is so delicious and filling, and I even let myself use the Porcini Mushrooms despite Dave’s hatred for them. I just had him pick them out, and everything was right in the world. 1. Put 6 cups water, the beans, barley, garlic, carrots, celery, onions, bay leaf, 1 1/2 Tablespoons salt, herb blend, some pepper and the porcini mushrooms (if using) in a slow cooker. 2. Chop the tomatoes, keeping the juice and put the tomatoes into the crockpot with all the juices. 3. Cover and cook on high until the soup is thick, about 8 hours. 4. 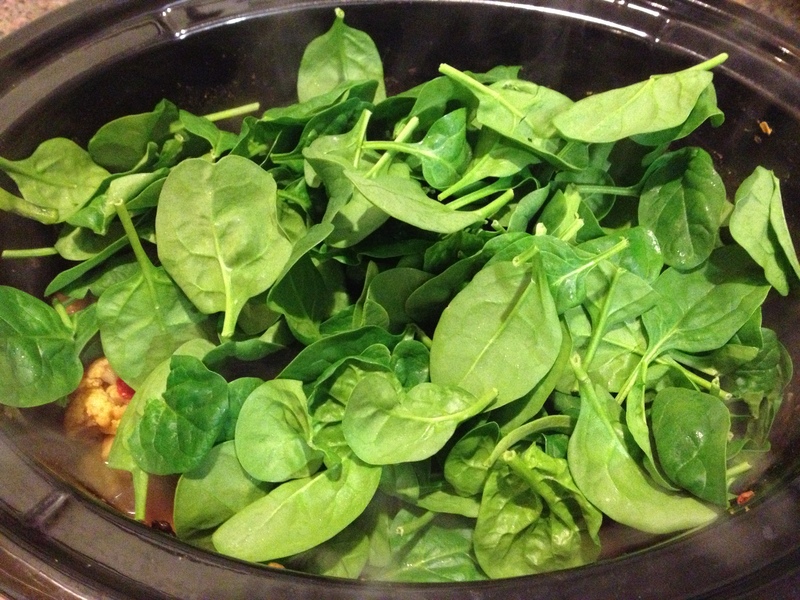 Add the spinach and cheese, and stir until the spinach wilts, about 5 minutes. 5. Remove the bay leaf and season with salt and pepper. 6. Ladle into bowls and drizzle each serving with Balsamic Vinegar and Olive Oil. ENJOY! Drizzle of balsamic and EVOO does the trick. So good. 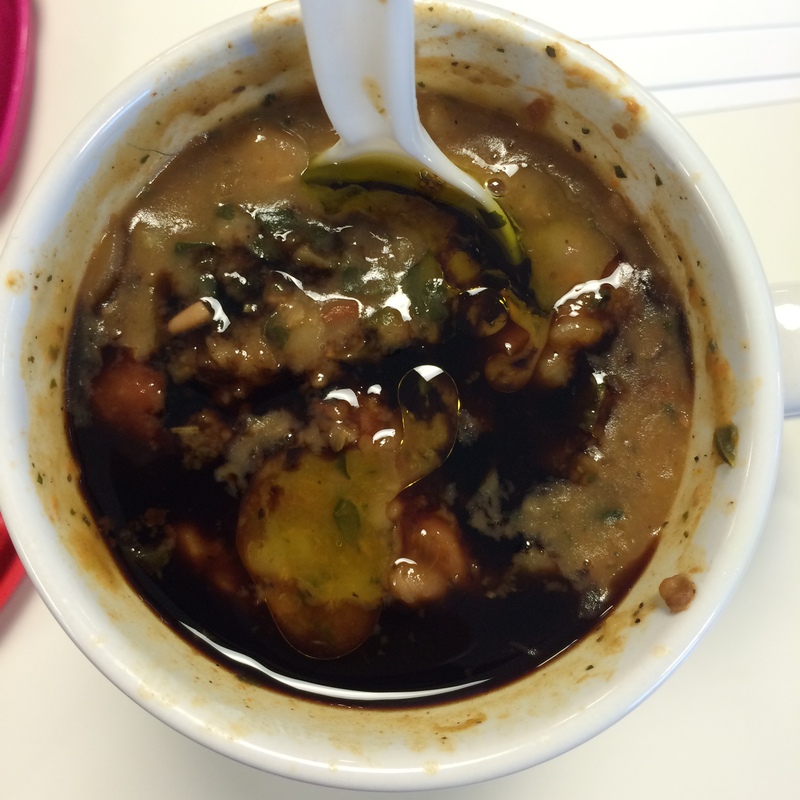 I shared this soup with a few friends from work, and we all loved it. It’s thick and creamy and rich, without sacrificing the positive qualities of all of the good stuff in there. It’s so healthy! I found this recipe to make about 6 pretty big servings. Don’t skimp on the Balsamic and EVOO- I added just a little bit to two tiny tupperwares when I brought this for lunch, and I’m glad I did! 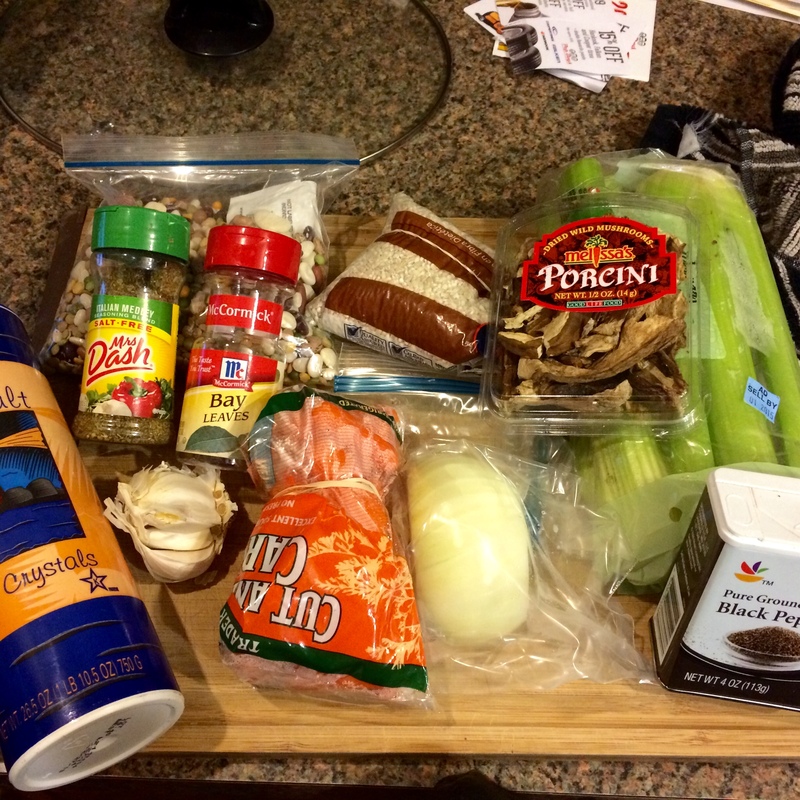 The Balsamic gives the soup such an awesome interesting flavor, and it is a great contrast to the richness in the soup. 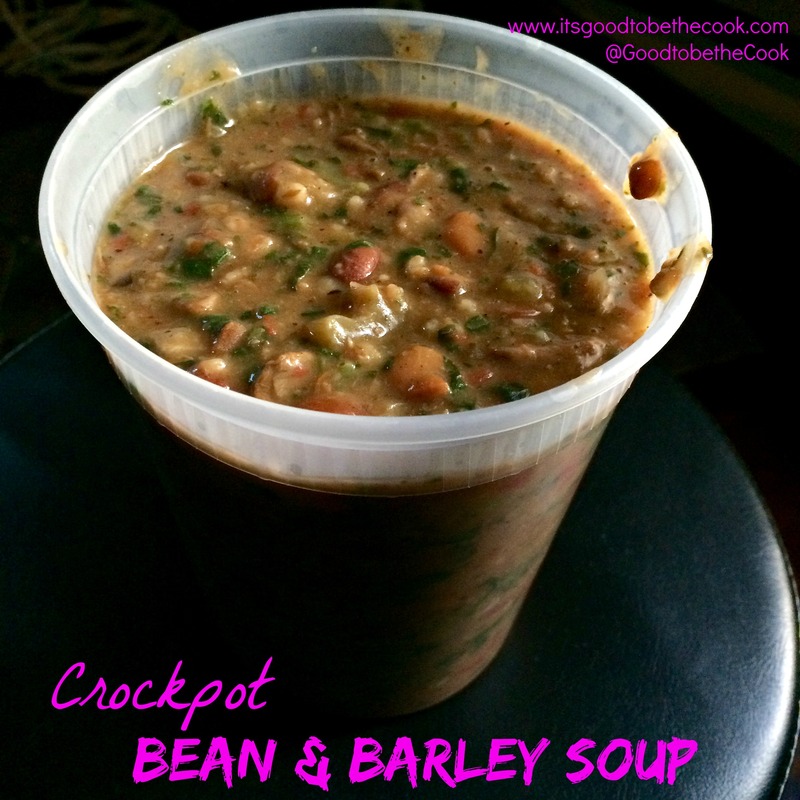 What crock recipes have you been making this winter? Feel free to share! I know that typically people whip out their good ol’ slow cookers in the dead of winter, but I am super happy I decided to try this out despite the fact that it’s (OMG… already?!?) July! There’s absolutely something to be said about a recipe that takes zero effort to prepare and no time standing over a hot grill, oven, or stovetop. And I just love having a “Meatless Monday” to start my week of right. What I love so much about cooking -and blogging- is that I can find so many different recipes from different places. 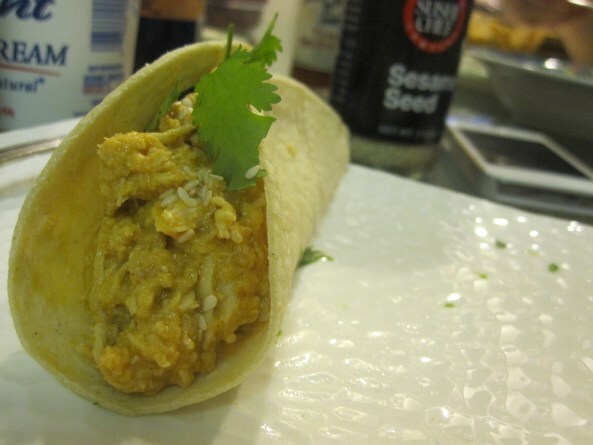 This recipe happened because of a really awesome blogging club that I participate in, called The Secret Recipe Club. Forget what my Secret Recipe Club is? Every month, we are assigned a new blogger. We get to pick ANY recipe that blogger has written about and cook it up ourselves. We can make adjustments according to our tastes too. All of the bloggers post their results on the same day and we all get to see who had who and more importantly, what delicious dishes were made! This month, I was paired with the adorable vegetarian blogger, Amanda and her blog Dancing Veggies. 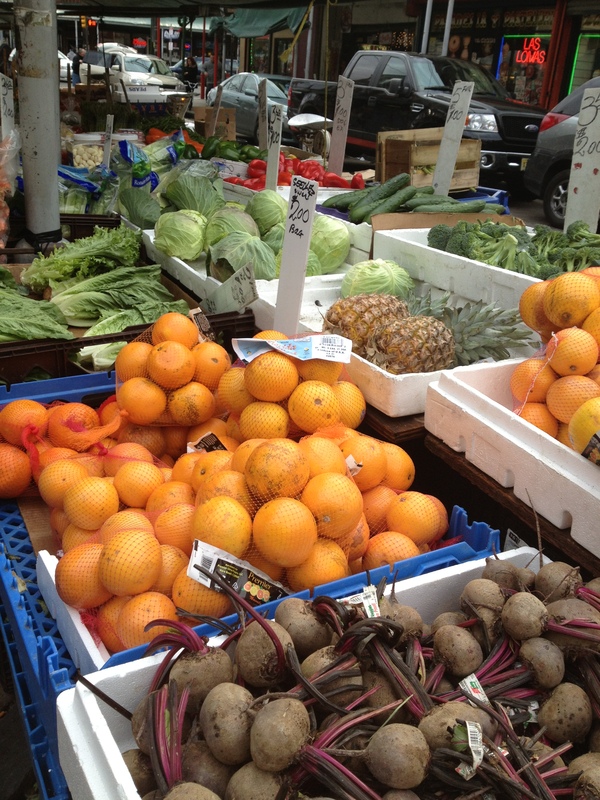 Despite being the opposite of a vegetarian, I totally fell in foodie-love with Amanda’s blog. Her veggie dishes are super flavorful and complex, it was so hard to pick just one. 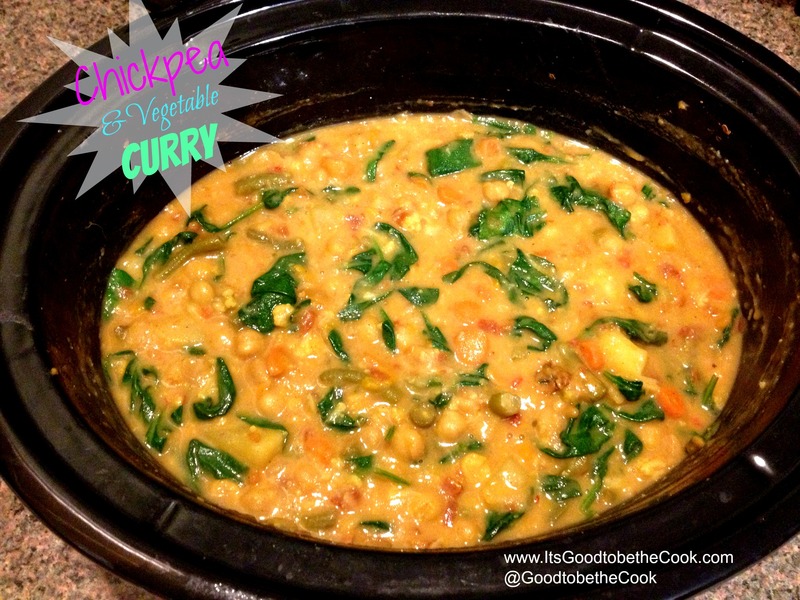 Amanda loves spicy food, like us, so this Crockpot Coconut Curry won out. It was amazing! 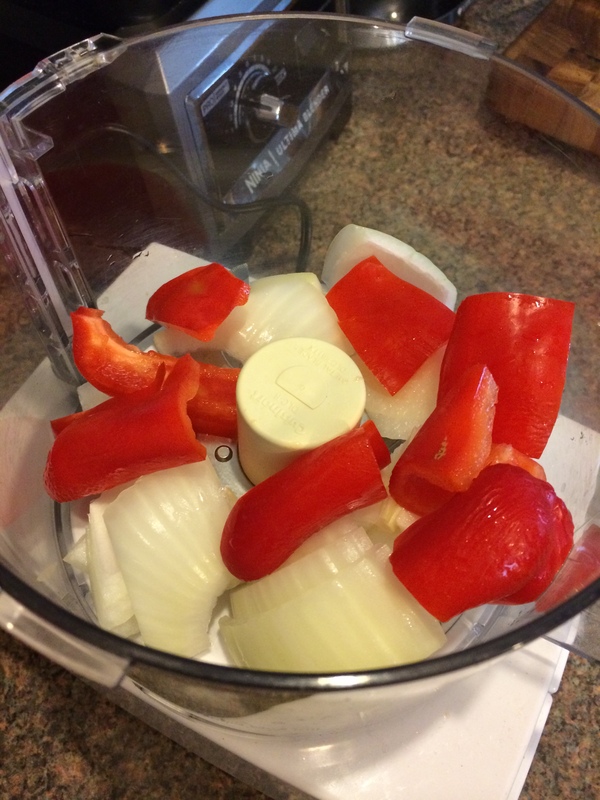 Place the onion, bell pepper, and thai chilies into a food processor. Pulse until finely chopped. Add garlic, tomato paste, coconut milk and spices and process until smooth. 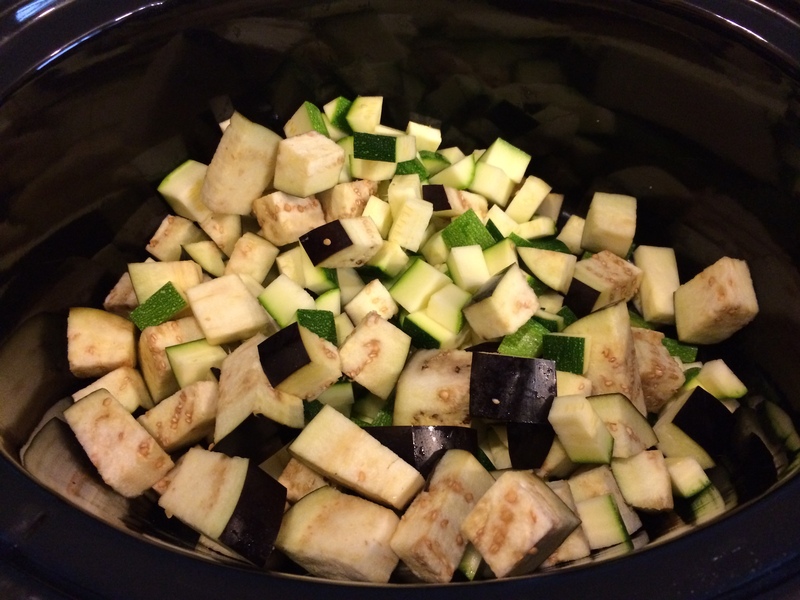 Place the veggies and sauce into the slow cooker. Cook on LOW for 4 hours. Serve over rice with delicious naan bread. Top with a dollop of yogurt and some fresh parsley if desired. Sauce is complete and ready to go. Dave and I were just dying over this curry! The veggies become completely melt-in-your-mouth delicious, and the curry sauce is thick and packed with spice and flavor. I served the curry over some brown basmati rice from Trader Joe’s and skipped the Naan this time. 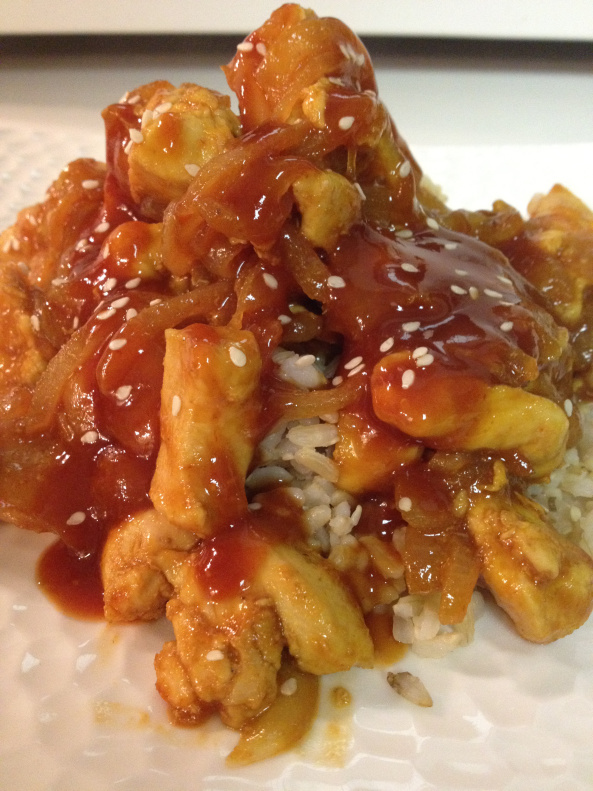 This healthy dish should definitely make it into your weeknight repertoire! ENJOY, and don’t forget to check out the other posts written below by the fabulous bloggers in the SRC! This week called for a crockpot meal. I have been exhausted with everything going on right now, and HELLO… has anyone been outside in the last two months?! This kind of miserable cold, snowy, icy, rainy weather practically begs for a nice hearty chili that smells up the whole house… mmmmmmmm. 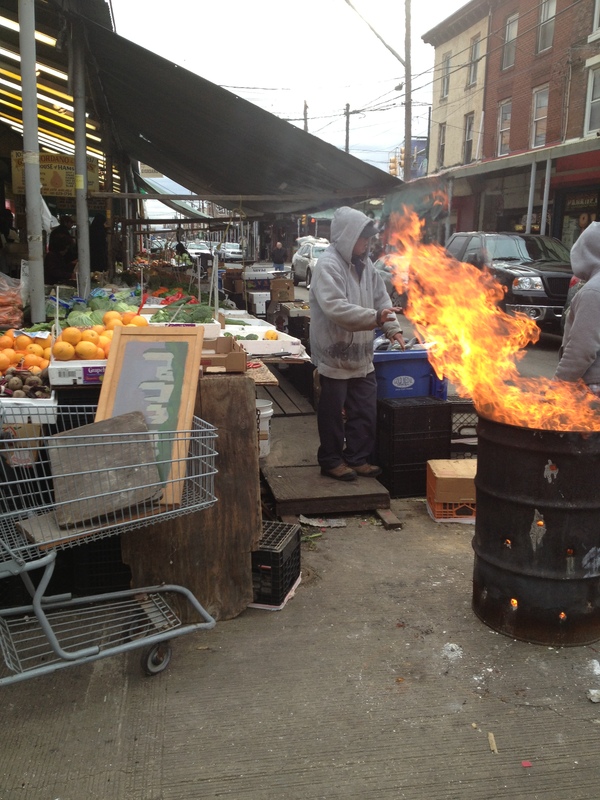 Dave and I went to the market this weekend with Chili in mind. 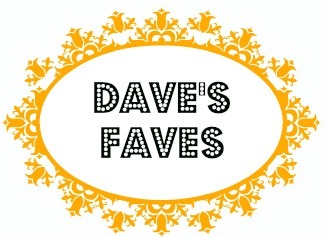 Dave walked up to the meat area and turned around with something in his hand and a huge smile on his face. 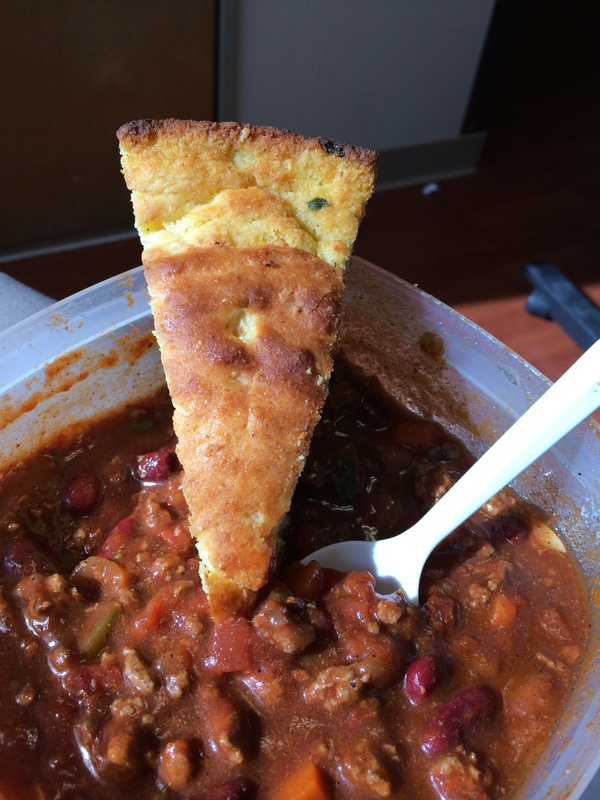 “What if we make our chili… but with LAMB?!? ?” I shrugged my shoulders and said “Why not?!”. As we walked away with two pounds of Organic Ground Lamb, we couldn’t help but laugh that Dave’s comment was 100% something our friend Donny would say (or probably has said before). Although there are probably some pretty awesome lamb chili recipes out there, we really were just in the mood for “our” chili, so we didn’t change the flavor too much, except we did add some extra cumin. And as always (and as in most of the recipes I cook) you can change the ingredients and spices to fit your own preferences. 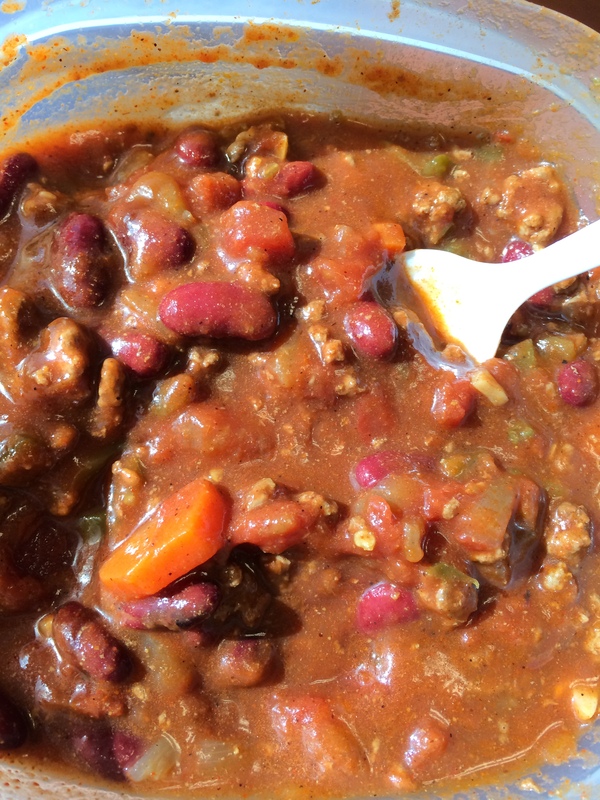 Do whatever you want… but I will tell you… this chili is bangin! 1. Cook the lamb over medium-high heat in a large pan, chopping into small pieces. When the lamb is cooked through- drain and place in the bowl of a crockpot, leaving about a Tablespoon of grease in the pan. Cook the onion, garlic, carrots, and peppers for about 10 minutes, stirring occasionally, until the veggies are soft. Add to the crock. 2. Add the rest of the ingredients into the crock. The extra seasonings are what I suggest to add, but you can really do whatever you’d like! Cook on low for 6-8 hours. mmmm! Do yourself a favor and serve with this cornbread. So. Good. This month, for my Secret Recipe Club assignment… I ended up making two of her recipes! There were just so many to choose from, I couldn’t decide on one. For those of you who are new to this or just not paying attention- the Secret Recipe Club is a really cool group I joined last winter. Every month, we are assigned a new blogger. This month, I was paired up with Lisa from “Cook Lisa Cook“. We get to pick ANY recipe that blogger has written about and cook it up ourselves. We can make adjustments according to our tastes too. All of the bloggers post their results on the same day and we all get to see who had who and more importantly, what delicious dishes were made! 1. Place everything up to and including the bay leaves into the slow cooker. Stir to combine everything and make sure the chicken is coated well. Refrigerate overnight or use immediately. 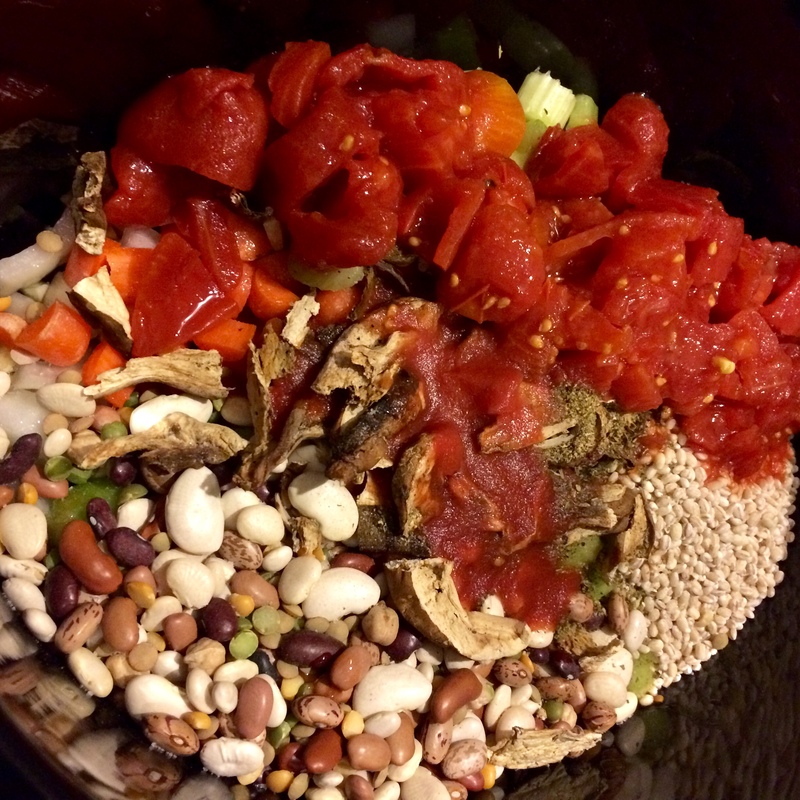 When ready to cook, place the crock into the slow cooker, cover and cook for 8 hours on low or 4 hours on high. 2. When done, in a medium bowl, whisk together the heavy cream and corn starch, then pour the mixture into the crockpot and gently stir. Let cook an additional 20 minutes to thicken up. 3. Serve hot over a bed of rice and garnish with cilantro. Want more Slow Cooker Recipes? Check these out! Do you just love spicy food? 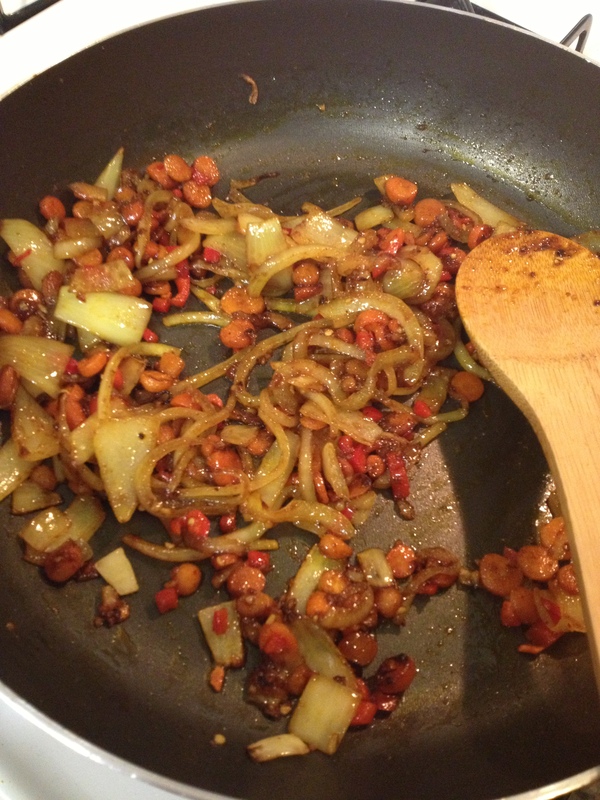 Here are more spicy recipes! 1. 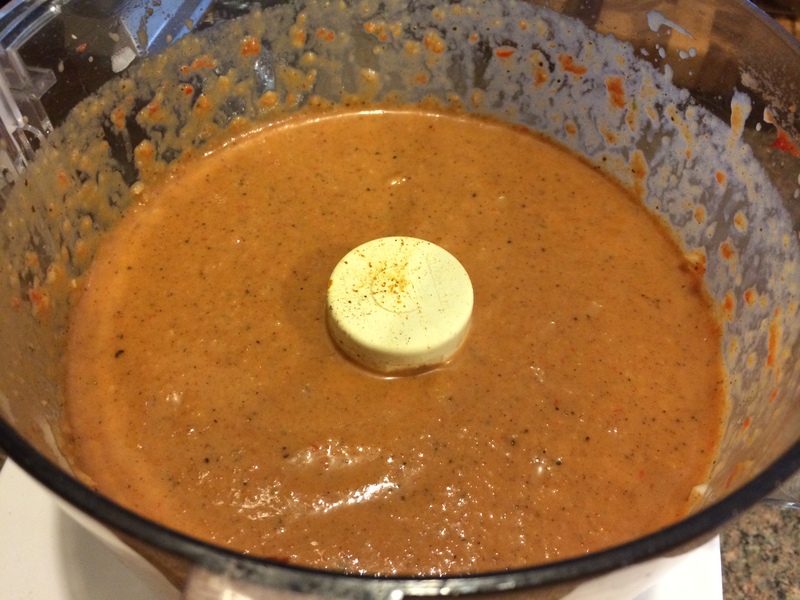 Mix everything except the garnish in a blender until smooth. I had to stir it around a few times to help it get going and add a little bit of skim milk to make it a little less thick. 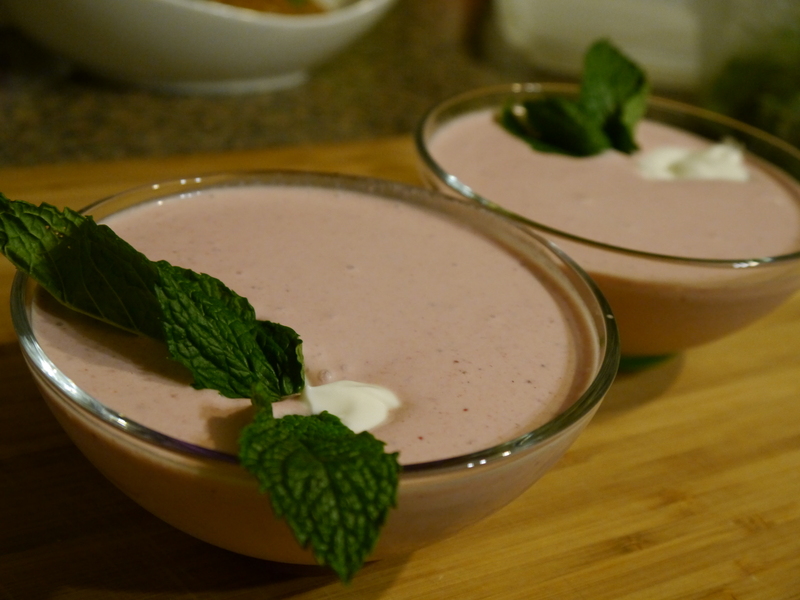 Using a blender mix together the strawberries, heavy cream, sour cream & yogurt until smooth. 2. Refrigerate until ready to serve. Stir or shake will before serving. Add a dollop of sour cream, fresh strawberries, and mint leaves for garnish. Everything ready to hang all day in the crock! 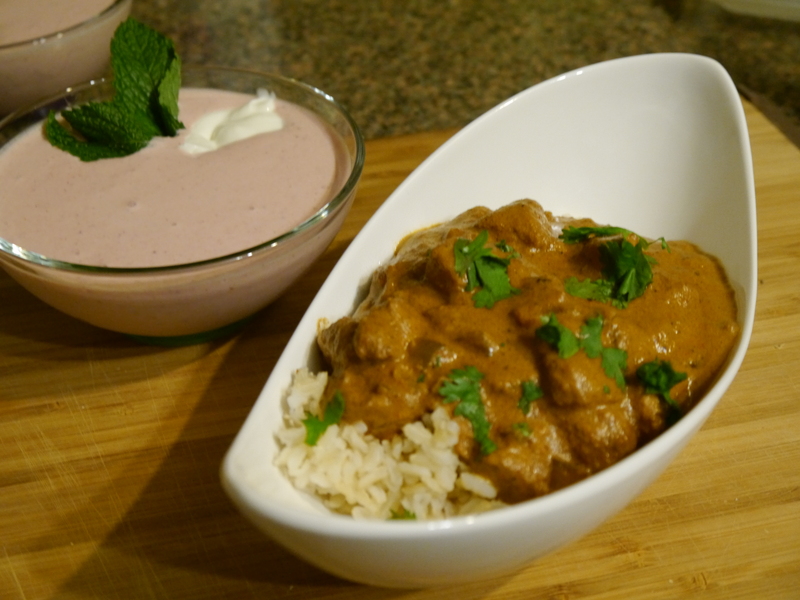 The Strawberry Soup was the perfect complement to the spicy chicken dish. I would even love to add a drizzle of balsamic vinegar or a balsamic reduction to add more depth of flavor next time. The Chicken Tikka Masala itself had so many complex flavors with the curry, the cinnamon and of course the garam masala. 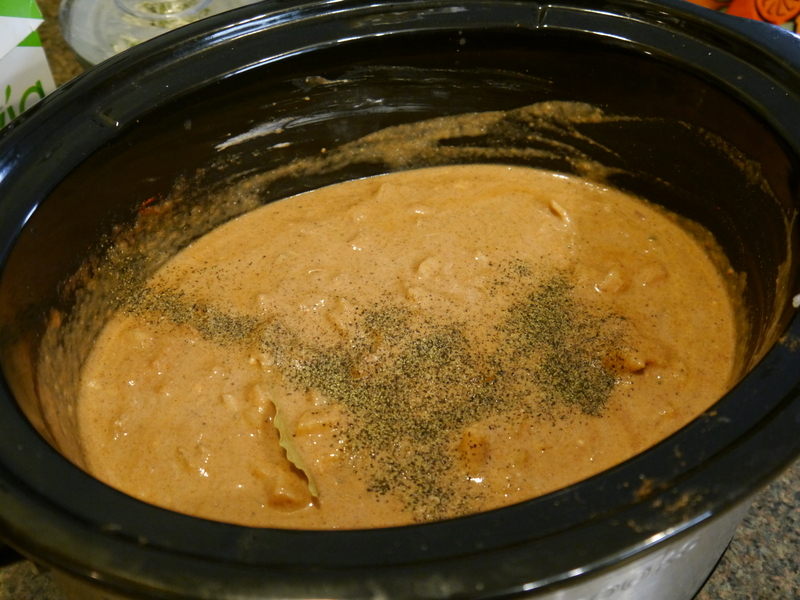 I was super excited to use the garam masala… I’ve had it for a few months and never had a chance to use it! This was the perfect amount of creamy and spicy for us. MMM! Okay everyone, now time to check out the other amazing recipes revealed today! ENJOY! I have been a busy busy girl the past week or two with the holidays and some other things going on. Dave and I split our holiday time between our two families so we got to celebrate Passover sedar twice! I was so excited when my Mommom told me I could make something to help out this year. I was back and forth as to what to make but finally decided to take on the responsibility of making the Brisket. This would be a risky choice, having never made it before… but I was up for the challenge. With the assistance of my crockpot and my handy-dandy Smitten Kitchen Cookbook, I made one hell of a brisket! Yay! I realize Passover is OVER for this year, but there is always time for a good Brisket. 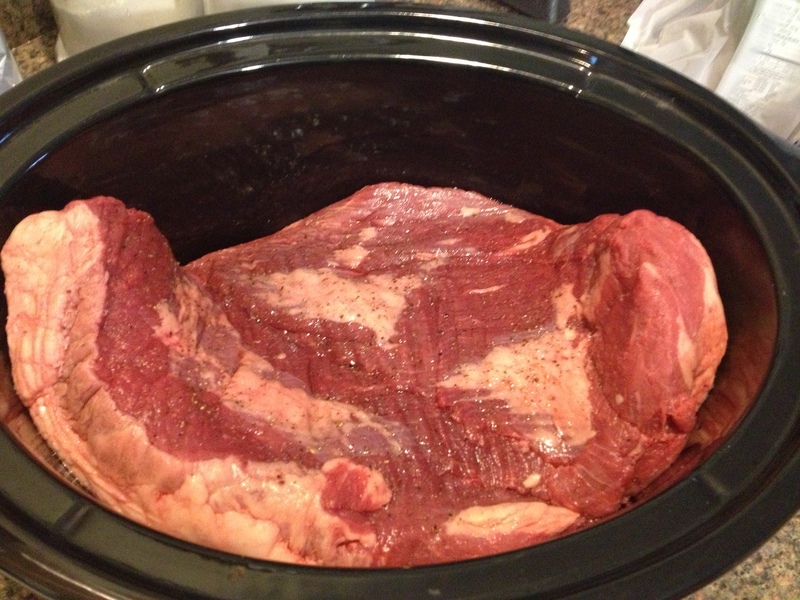 Step 1: Cook Brisket. Season the meat with Salt and Pepper on both sides. Whisk the remaining ingredients together in a medium sized bowl. 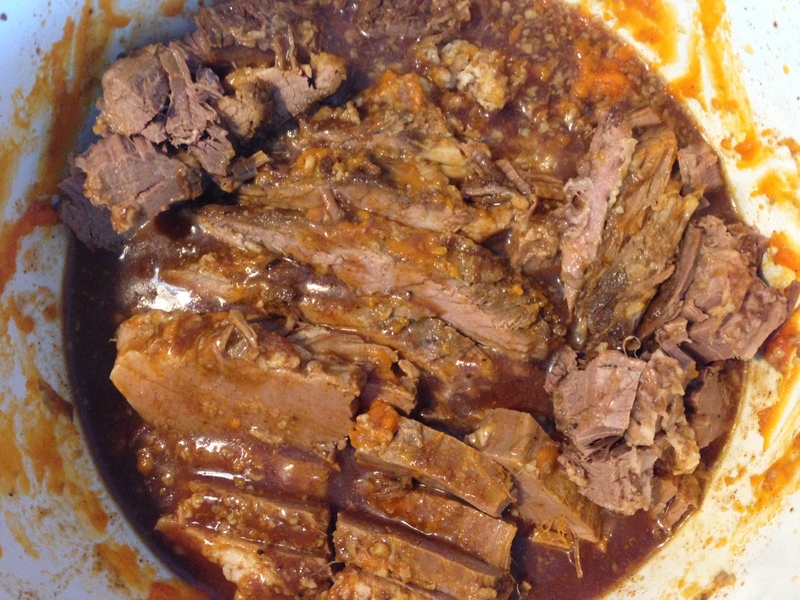 Place the meat in a slow cooker, pour the sauce over it, and set it to cook on LOW for 10 hours. Your house is going to smell phenomenal. Step 2: Rest Brisket. Resist the urge to eat the brisket… it’s going to get better with time. While the meat is still hot, scrape off any large fat pieces on the edges. There was a TON on mine. Transfer the brisket into a baking dish, making sure to keep all of the sauce too. Chill in the refrigerator for anywhere between a few hours to a whole day. Step 3: Re-Heat Brisket. 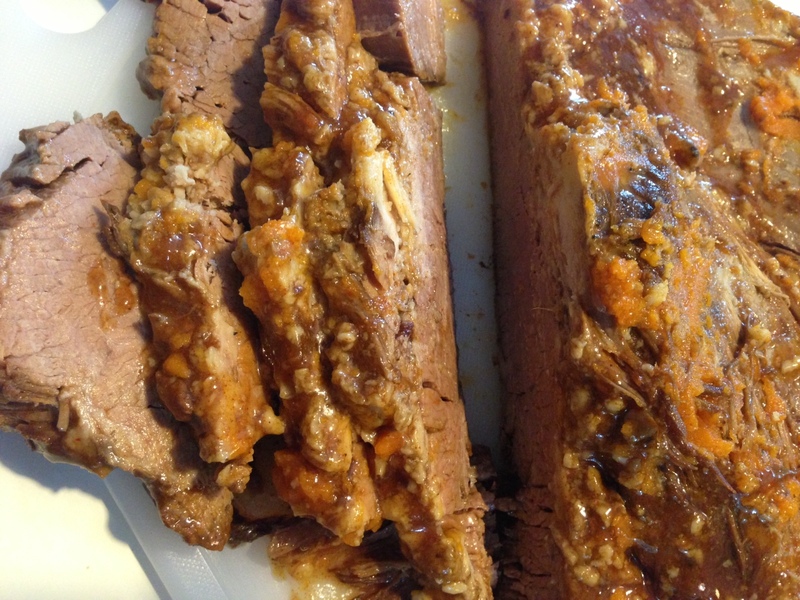 An hour before you need to eat the brisket, preheat the oven to 300 degrees. Remove the grease that has hardened on the top of the meat and sauce (or not, but it’s really nasty so I recommend it). Remove the brisket from the dish and place on a large cutting board. Slice while cold and transfer back into the saucy baking dish and spoon the sauce over the meat. Bake in the oven until heated through, the sauce should be bubbly on the edges. Serve immediately. Note: The original recipe includes directions for cooking in the oven. 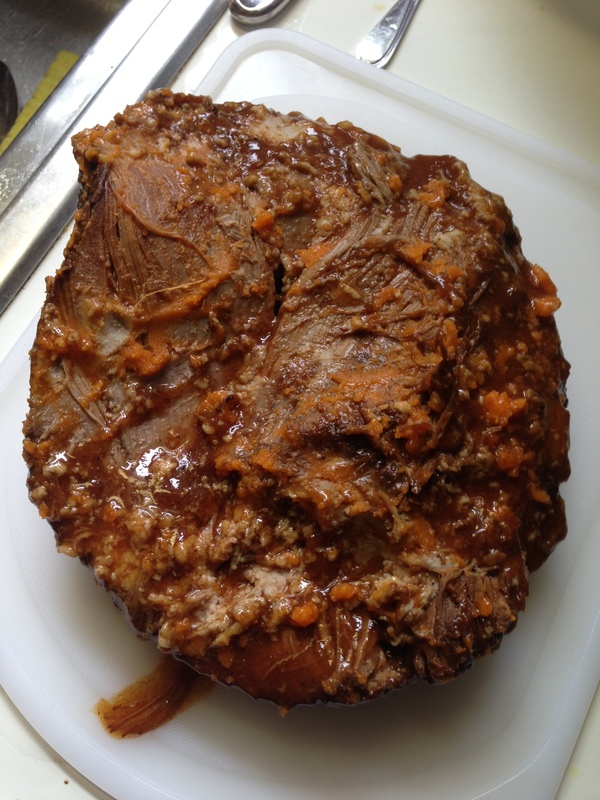 Briefly… Cook the meat in a 350 degree preheated oven in a dutch oven or in a baking dish tightly covered with foil. Bake for 3 hours. Had to stuff this bad boy in there! It’s amazing how much it shrinks though… so much fat to remove. 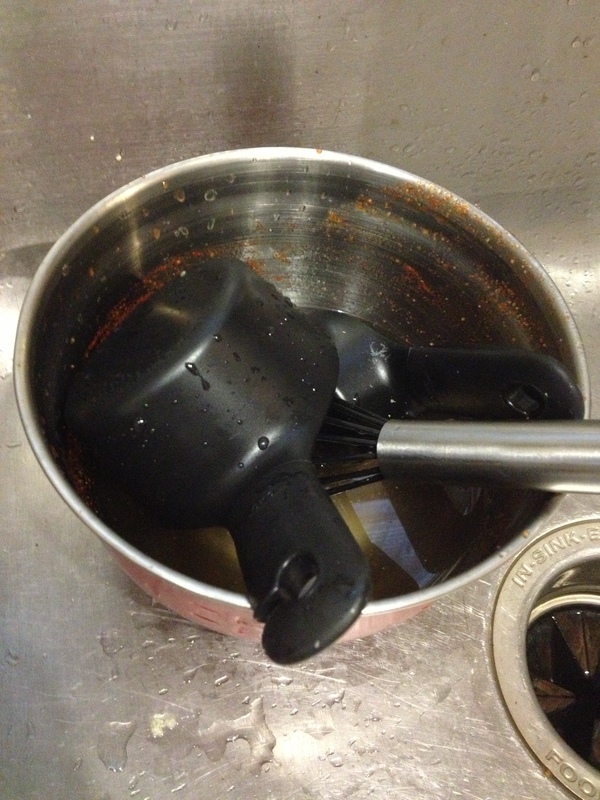 This is all I had to dirty while making the brisket… love it. 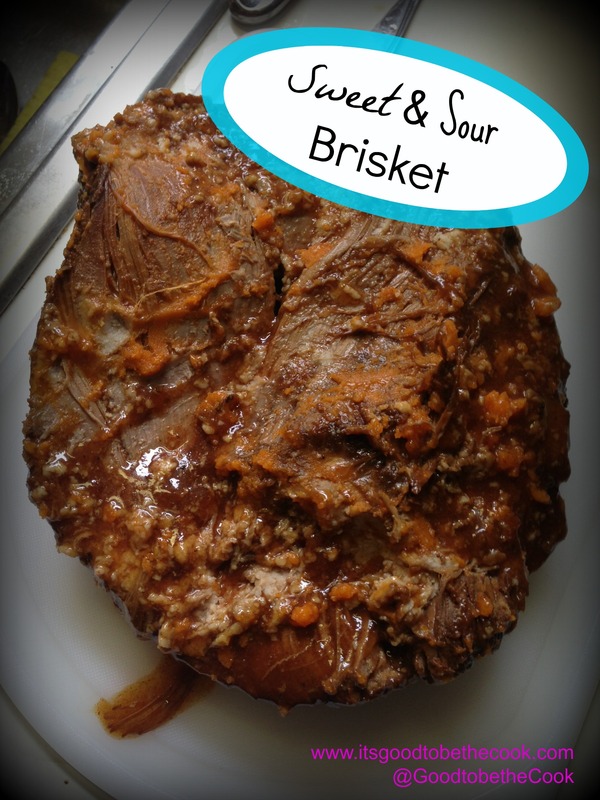 I was SO nervous about this silly brisket! I really wanted to make something big and new and exciting and I didn’t want to screw it up. To add to my new recipe anxiety, I was stupid and didn’t read the cooking time until I had already started at 6:30pm on Saturday. If I did it the right way, that would have meant to take it out at 4:30am. LOL. Lucky for me, Dave was out at a bachelor party and I was already waiting for him and awake at 2:30 to finish the brisket up. Lesson learned: read directions first. Duh. Cooled brisket with the grease scraped off. Ready to be sliced. It’s easiest to slice the brisket when it’s cold. You’ll get better slices whereas when you cut it after it’s reheated it’ll be more fork tender and fall apart. Once the brisket is cut, I transfered it to my dutch oven to heat up for dinner. Don’t stress if the slices break a little… those will be the best bites! What a great spread… brisket was so good. Despite my nerves and anxiety, the brisket was awesome. It was so easy to make and turned out absolutely perfect and delicious. 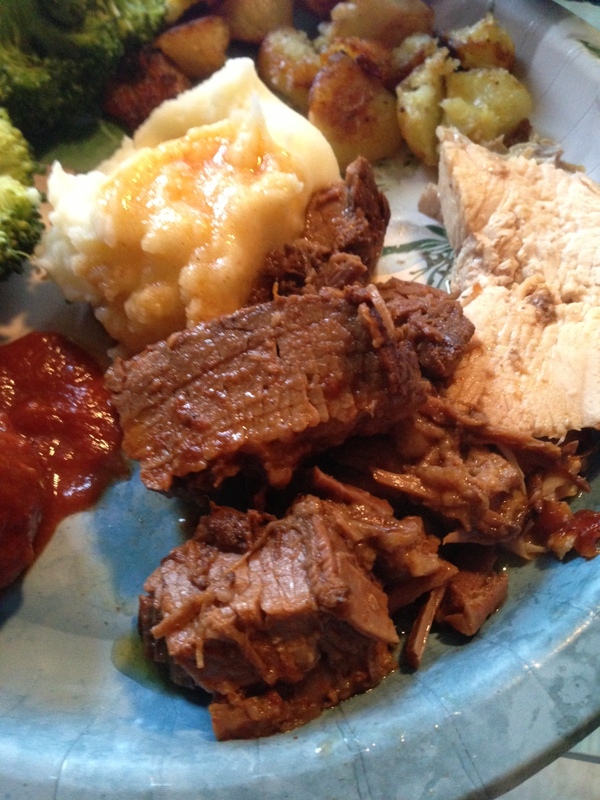 The brisket was so moist and flavorful, it was also the perfect combination of sliced pieces and the fally-apart pieces that sop up all the sauce. MMM! I do have to pat myself on the back once more and mention to you that my Dad who has NEVER tried Brisket in my lifetime not only tried this one… but really liked it. Whatttttttttt?! 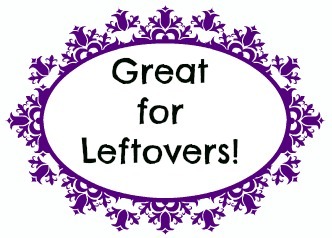 It’s a good thing when there are no leftovers, right? I’d say next time I’d make a bigger one but this 5.25 lb baby hardly fit into my crockpot! Don’t forget to FOLLOW me on FACEBOOK, TWITTER, INSTAGRAM, & PINTEREST! 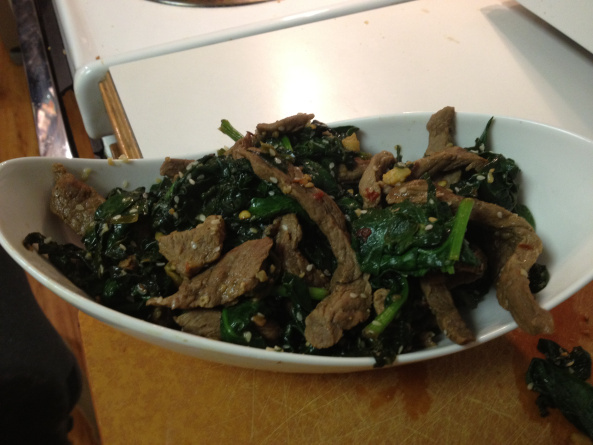 After last week’s slow cooked Asian Beef was a huge success, I was inspired to find more recipes for my crockpot. 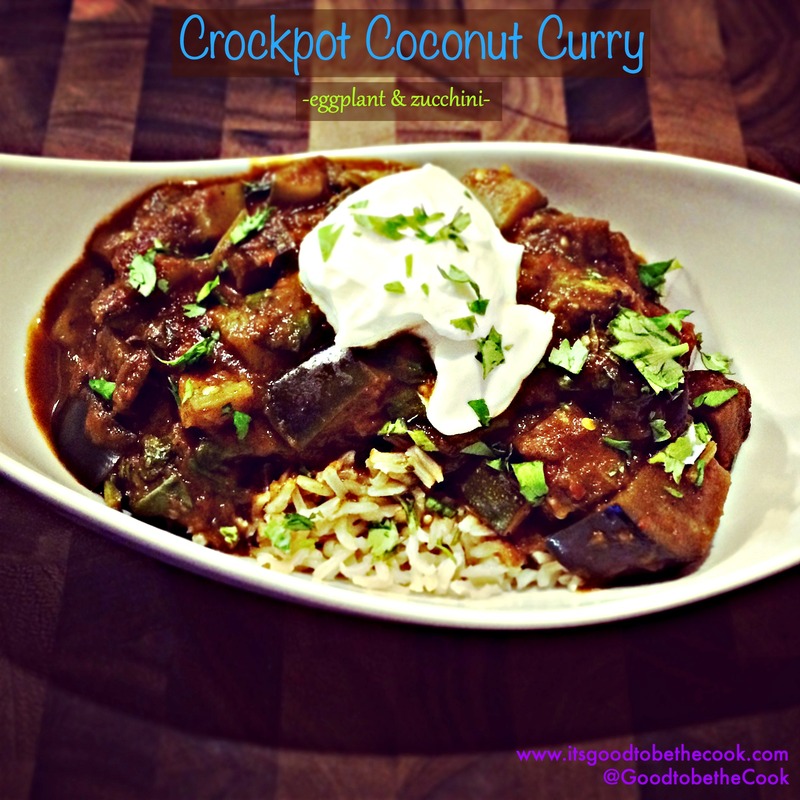 I had been holding onto this Indian inspired Cooking Light recipe since forever ago. It just sounded so easy- something not typically associated with Indian flavors. I really, really, really love this recipe. I actually ended up making it while I was making another dinner so we could eat it throughout the week as leftovers. While it was delicious when I cooked it up, it got even better when it sat in the fridge and then was reheated. MMM! Don’t get overwhelmed by the amount of ingredients here. It’s simple: Chickpeas, Veggies, Spices, and a few Cans. That’s really all there is to it. 1. Chop all your veggies. Heat oil in a skillet over medium heat. Add onion and carrot, cooking for 5 minutes or until tender. Add curry powder, brown sugar, garlic, and hot pepper. Stir and cook for another minute. 2. Place the onion mixture in a crock pot. 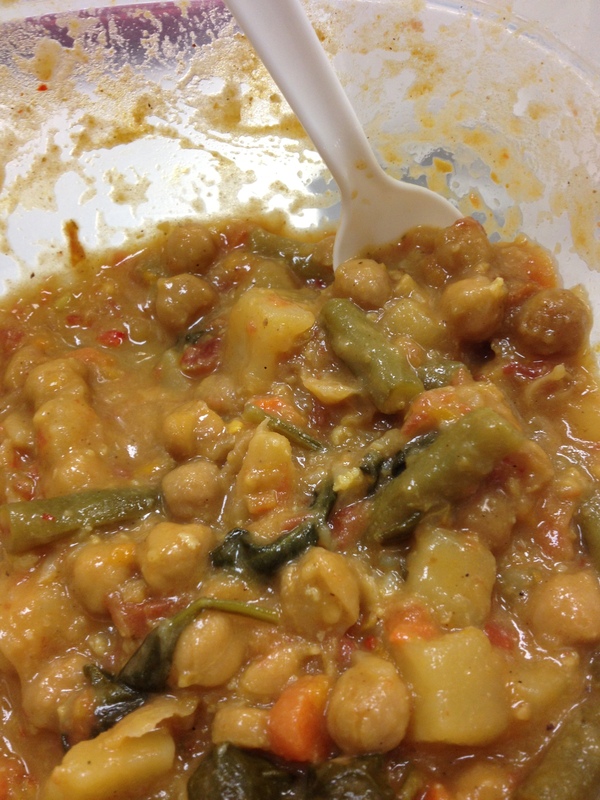 Stir in chickpeas, potato, bell pepper, green beans, cauliflower, salt, pepper, cayenne, tomatoes, and broth. Cover and cook on high for 4-6 hours or until potatoes and veggies are tender. 3. Add spinach and coconut milk. Stir for a minute, then serve! Here we are before it’s cooked for 4-6 hours. 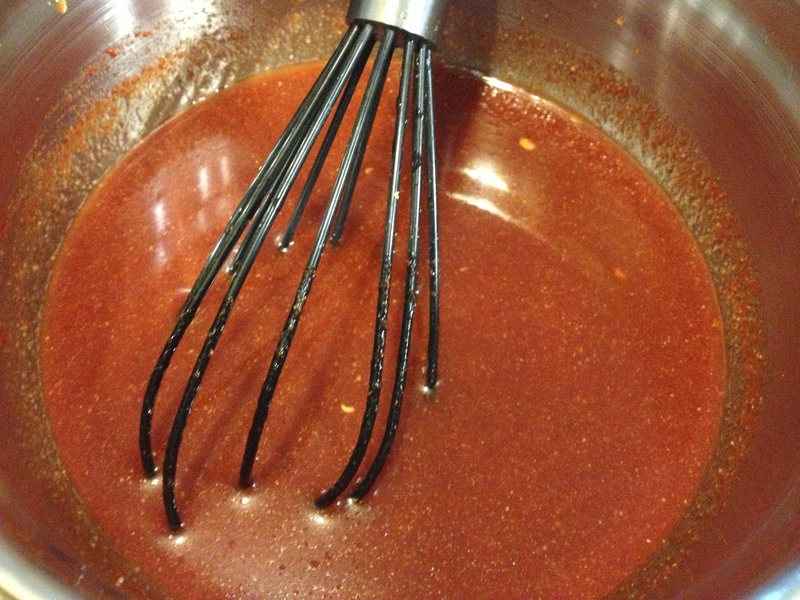 I made ours a little extra spicy by adding some more Cayenne… obviously! So, this recipe would work with any types of veggies. I had so many veggies leftover from our trip to the Italian market that I just threw them all in there. Have fun and get creative here! I LOVE spinach, so I just threw a whole bunch on there. It’s also so healthy! 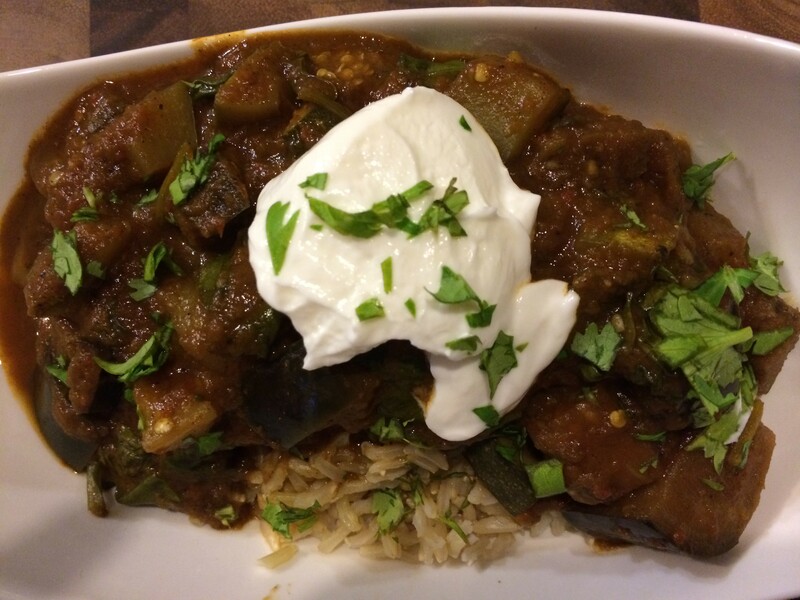 This curry would be delicious over Jasmine Rice or Quinoa, but we just ate it plain. It’s healthy and actually very filling! The finished product, so creamy and delicious. 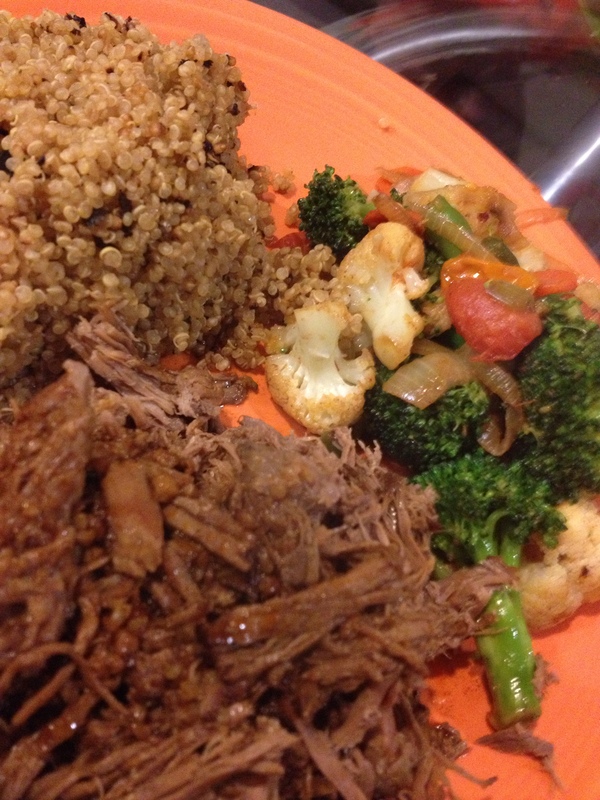 This is how it looks as leftovers… mmmm! 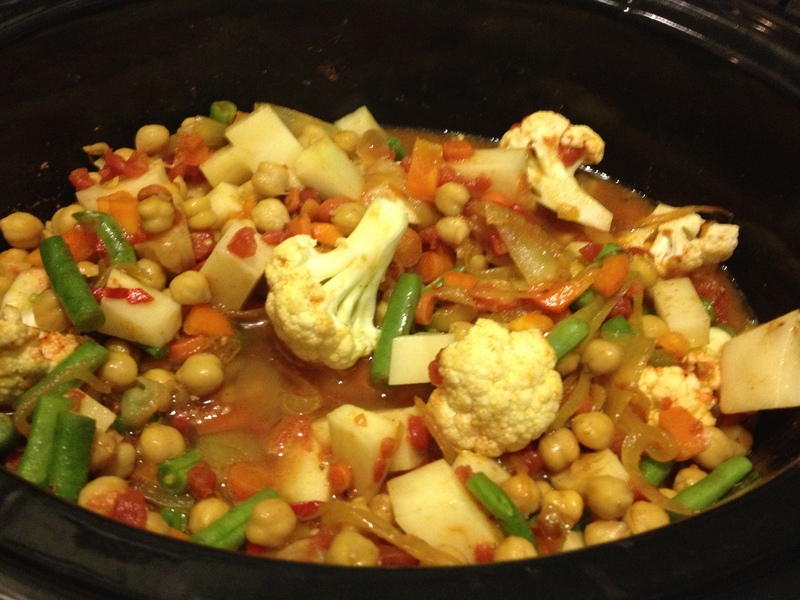 I am so excited to tell you that I used my slow-cooker for the VERY FIRST TIME yesterday! Well- that is… the very first time to make something other than Chili. All my favorite bloggers and friends are all wintered-up, talking about their slow cooked meals that are easy as pie and ready when they come home for work. I was starting to get jealous. I was determined to find an awesome recipe for a hunk’o’meat and try this whole thing out myself. The recipe I found was from the blog Foodie w/ Family and obviously got my attention since my boyfriend Dave and I LOVE two types of food: Spicy & Asian. This recipe happens to be both. Not too bad! Dave and I stopped by the Italian Market over the weekend and picked up a 3lb Boneless Top Round Roast from the butcher. I made the marinade Monday night and put it in the refrigerator in a container so it would be all ready for me on Tuesday. 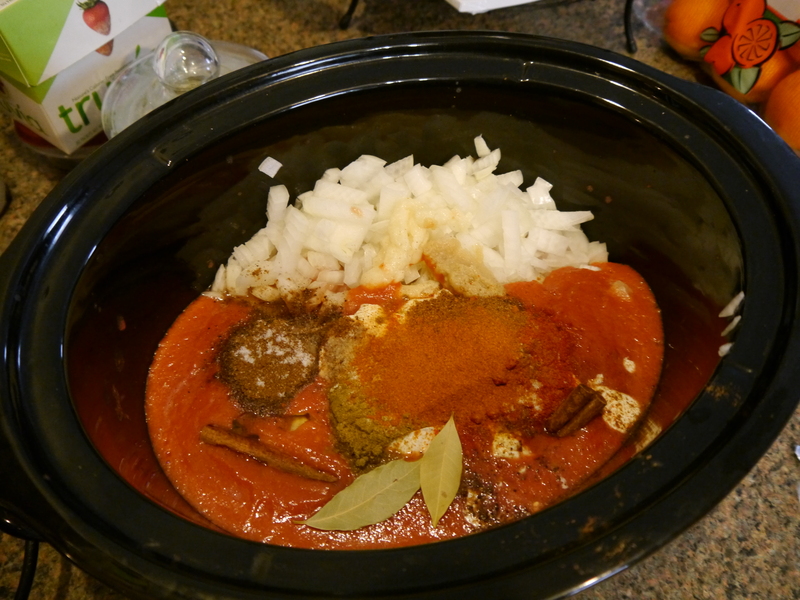 Tuesday afternoon, I stopped home to let the dog out and put the meat & marinade into the slow cooker. Pressed “Low”… and waited. And waited. Okay, so I “waited” while I drove back to work, finished my work day, worked out for 2.5 hours, and THEN came home for it to be ALL DONE and waiting for me to devour it! 4 cloves Garlic, peeled and lightly smashed with the side of a knife. 1 (2-inch) piece of Ginger, lightly smashed with the side of a knife or sliced. 1. Place the beef in the slow cooker. Drop in the garlic and ginger around the beef. Mix the broth, vinegar, 1/4 cup of honey, soy sauce, fish sauce, and sriracha sauce and pour the entire thing over the roast. Cover and cook on LOW for 6-8 hours or on HIGH for 4 (I did low and slow!). The beef is done when it is fork tender. … go ahead and just stab it to see! 3. Meanwhile, shred the beef using two forks. You can mix the sauce directly in or pour over each individual serving. This looked so yummy too- I might have to try a sandwich next time. The beef turned out soooooooo yummy! It just melted in your mouth and had such good flavor from the marinade. It wasn’t too spicy but it also wasn’t too sweet, it was sorta just perfect. Dave and I went low-carb cooked up some Quinoa and a Veggie Stir Fry on the side (Onion, Carrots, Celery, Jalapeno, Cauliflower, Broccoli, Green Beans, and Tomatoes). We decided to sauce our plates ourselves so we were able to pour it all over the entire plate… mmm! 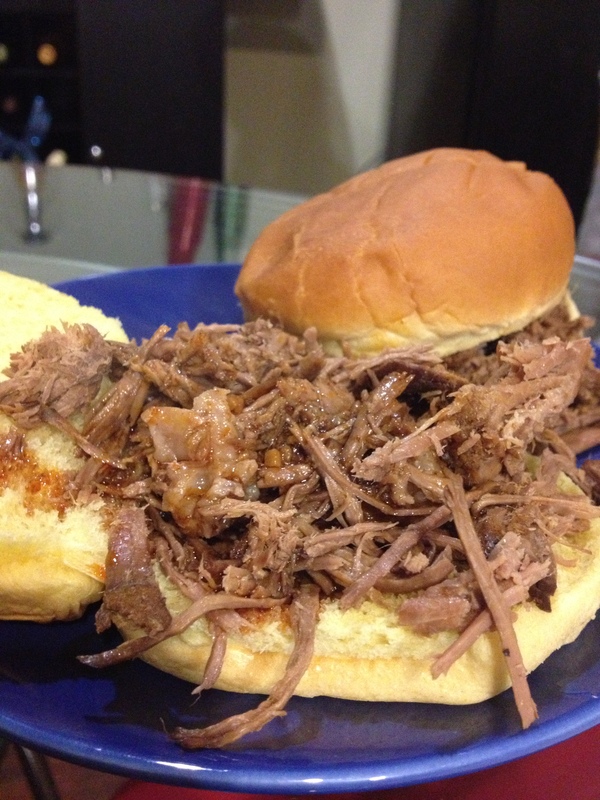 Our roommate Adam even dug in and ate the beef as a sandwich on soft potato rolls… they looked amazing! The Slow-Cooker verdict is: Thumbs Up! 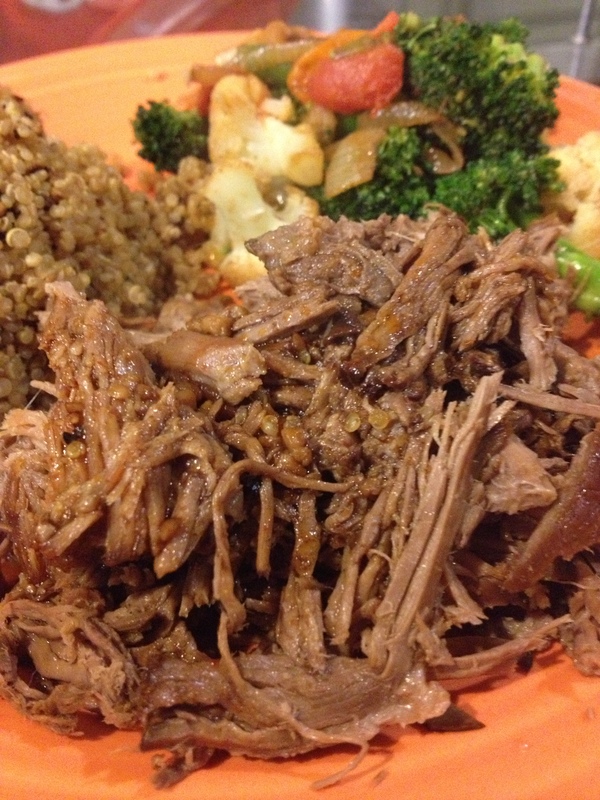 Both of the boys asked for me to make this beef again, and to use the slow cooker more often. Considering how easy this was… I absolutely will!